The Fujinon 7.6-130mm f/1.8-2.3 ENG Style Lens with Digital Servo Focus & Zoom with Quickframe provides 2/3" cameras with a wide to long telephoto focal range. The fast maximum aperture is f/1.8 at 7.6-102mm and f/2.3 at 130mm. 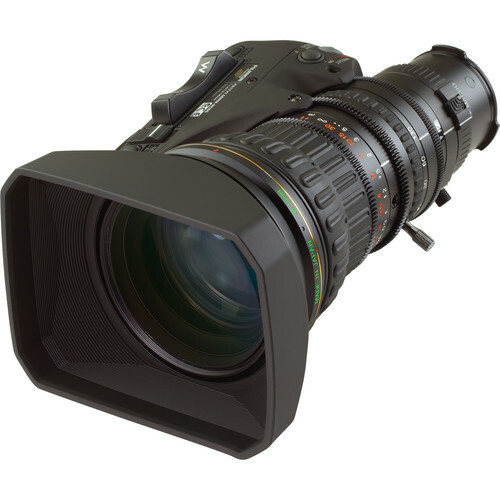 Fujinon's digital servo for focus and zoom facilitates full servo control via RS-232, and Quickframe provides fast manual zooms without disengaging the servo zoom lock. Internal focusing minimizes the effects of lens breathing, ensuring a more consistent focal length when making focus adjustments. QuickZoom improves zoom speed to 0.7 seconds end to end. With the push of a button, QuickZoom facilitates a rapid shift to the telephoto end to check focus. Releasing the button automatically returns the lens to the previously selected focal length. The Zoom Limit function purposefully constrains the focal range to only desirable focal lengths. The Inner Focus design means that any focusing action only moves elements in the middle of the lens so the length of the lens does not change while focusing. This feature also enables the use of polarizing filters and matte boxes because the front element will not rotate. Quick Zoom provides for a rapid zoom movement to the telephoto position to check focus with the simple push of a button. Releasing the button returns the lens to the previously selected zoom position. Quick Zoom speed is improved to 0.7 seconds end to end. Quickframe allows the operator to make manual zooms while the lens is in servo zoom mode. The mechanical clutch that allows this function reduces backlash in the zoom motor/lens combination, providing extremely accurate and repeatable zooms, which makes this lens well suited for robotic and virtual reality applications.